Engaging with Aboriginal businesses (e.g. Red Arrow Group). Engaging with an Australian Disability Enterprises (ADE) for employment of job seekers with disabilities. This article defines social procurement and social enterprise and explains the Victorian government’s growing focus on the social value of large projects, including how focusing on local socioeconomic development can help address the problem of workforce shortages. The article also briefly outlines Victoria’s new Social Procurement Framework, which aims to make social procurement a normal part of government projects, and how businesses can start preparing for upcoming government tenders now. Help people experiencing homelessness or housing instability to access employment, from living arrangements, to getting work ready, to employment, such as Launch Housing or the Public Tenant Employment Program. Unemployed people from culturally diverse families. Indeed, the Victorian government already requires project contractors to develop Social Procurement plans, along with plans to employ priority job seekers as part of their workforce development. For example, Melbourne Metro Tunnel contractors are required to achieve a target of 2.5 per cent Aboriginal employment, among targets for other priority job seekers (4). Meanwhile the Victorian Government’s Major Project Skills Guarantee (MPSG) – as part of the Local Jobs First strategy – requires Victorian project delivery contractors to have apprentices, trainees and engineering cadets fulfil 10% of the labour hours on projects worth $20M or more. In this way, the State is encouraging project contractors to open up more training and employment opportunities, supporting the efforts of social enterprises, and helping to address predicted skills shortages. Other states are implementing similar requirements. For example, as part of the METRONET rail program in Perth, WA, the METRONET Aboriginal Engagement Strategy, also known as Gnarla Biddi, requires project delivery contractors to develop strategies to meet an Aboriginal Procurement target whereby 3% of project delivery contracts over $50k are to go to Aboriginal Businesses, and an Aboriginal employment target whereby >3% of project delivery hours are to be fulfilled by Aboriginal employees. Meanwhile, gender diversity targets are associated with such events as the Australasian Railway Association’s annual Women in Rail lunches, where women in rail speak about their career experiences, and subject matter experts raise awareness of industry gender statistics and employment barriers. While it’s been some years since the Victorian government has begun asking its suppliers to consider local, social and sustainable practices and targets in their tenders and quotes, Victoria has recently released its new Social Procurement Framework (published in 2018) which aims to make social procurement a part of normal government processes. The framework has 10 objectives, 7 of which are Social Procurement objectives (shown below in the left column with actions or outcomes for each objective shown in the right-hand column). The Framework lays out targets for government agencies to set out procurement planning requirements for large government projects. As mentioned before, such targets have been included in previous government projects, however this new framework aims to standardise these requirements. Such targets tend to encourage – or even require – collaboration, awareness, and sharing of ideas between mainstream organisations and social enterprises. For example, boosting the employment of priority job seekers often requires engagement with social enterprises that understands certain job seeker groups, and which partner with employers to facilitate employment. These specialised services understand their client base well, and often have processes to ensure that candidates are job ready by the time they meet the employer. Furthermore, it is common for these social enterprises to provide ongoing support for both employer and employee. All of this makes it a lot simpler for employers looking to employ more priority job seekers. Choosing one of the priority areas/objectives identified in Victoria’s Social Procurement strategy and being the best in the state for that focus area. In closing, the Minister for Industry and Employment says that the new Social Procurement Strategy endeavours to create a “fairer economy from which all Victorians can benefit – one which is innovative, inclusive and adaptive to change” (7) (Minister for Industry and Employment, 2018, Victoria’s Social Procurement Framework). Looking for advice and ideas for Social Procurement or other social strategies? You can contact Strategic Connections Group at admin@strategicconnectionsgroup.com. 1. Victorian Government. Victoria's Social Procurement Framework. Melbourne : Victorian Government, 2018. 2. Social Traders. What is Social Procurement. Social Traders. [Online] 2019. [Cited: March 24th, 2019.] https://www.socialtraders.com.au/about-social-enterprise/what-is-social-procurement/definition/. 3. Australian Government. Closing the Gap 2019. Indigenous.gov.au. [Online] 2019. [Cited: March 24th, 2019.] https://www.indigenous.gov.au/news-and-media/stories/closing-gap-2019. 4. Victorian Government. Jobs. Metro Tunnel. [Online] Victorian Government, March 7, 2018. [Cited: March 29, 2019.] https://metrotunnel.vic.gov.au/about-the-project/jobs. 5. Robin Scott, Minister for Finance. Message from the Minister for Finance. [book auth.] Victorian Government. Victoria's Social Procurement Framework. Melbourne : Victorian Government, 2018. 6. Coutts, Simon. Supply to Government? Price is not everything. LinkedIn. [Online] January 29th, 2019. [Cited: March 24th, 2019.] https://www.linkedin.com/pulse/supply-government-price-everything-simon-coutts/. 7. Employment, Minister for Industry and. Message from the Minister for Industry and Employment. [book auth.] Victorian Government. Victoria's Social Procurement Framework. Melbourne : Victorian Government, 2018. Strategic Connections Group attended the Australasian Railway Association (‘ARA’) Women in Rail Lunch for the second year in a row. Since last year, SCG has implemented changes to our flexible working policies, parental leave policies, and brought five new women onto the team. As champions of inclusiveness and fairness, we’re always looking at ways to make our workplace a place that can not only attract a diverse range of people, but retain them. Retention of women in the workplace was frequently touched on by the speakers at this year’s lunch. Particularly looking at how the rail industry can become an industry of choice, rather than individual companies striving to become an employer of choice. The ARA is aware of an impending skills shortage in the industry. This is in part due to a lack of distinct pathways into the rail industry, and in part due to not being an industry of choice. The Keynote Address was given by Professor Rae Cooper who is a professor of Gender, Work and Employment Relations at the University of Sydney. She noted that Australia has the most highly segregated workforce in the Organisation for Economic Co-operation and Development (‘OECD’). She referred to this as ‘glass walls’, as opposed to glass ceilings. The rail industry is a masculine industry with women making up only 20% of the workforce. Professor Cooper had conducted a study asking women of working age what their top two concerns were in their future work. More than 80% of respondents highlighted having a secure job and having a job in which they were treated with respect as their top concerns. If the rail industry wants to retain the women it hires and become an industry of choice, it should prioritise these two aspects. Professor Cooper noted that having a secure job didn’t necessarily mean having a long-term contract, but rather whether the employer seemed to be factoring them in for the long term. The rail industry needs to show career progression pathways for women starting out in the industry, and that they are factoring in up-skilling, promotions and training for them. It wasn’t all dire news. Firstly, Australia came out on top for having the most educated female workforce in the OECD. Secondly, Metro, the Gold Sponsor for the event, announced that of its new trainees, more than half are female. Finally, Danny Broad, the CEO of the ARA announced the launch of the ARA Women in Rail Mentoring Program which will run from June to November of this year, pairing up female employees of ARA member organisations who have less than two years’ experience in the industry with a mentor who has over fifteen years of career experience. This mentoring program aligns itself neatly with SCG’s current business model, which is centred around a knowledge transfer from experienced, industry experts to graduates, and those new to the industry. SCG plans to assist the ARA in addressing both their skills shortage crisis, and their push to increase and retain diversity in the workplace, through the creation of a digital repository of knowledge that captures and centralises the lessons learned by those at the end of their careers. This digital repository can be used to efficiently disseminate information to the next generation of rail industry experts, reducing training time and lifting the standards of the industry as a whole. Applications for the mentoring program open late April. You can apply and find out more information by going to ara.net.au/key-issues/women-rail. What a week! The Avalon 2019 – Australian International Airshow Aerospace and Defence Expo was a great success. We are very grateful for the support and interest shown in our company’s capabilities from the ADF, as well as Australian and international business. During the Expo, we were able to broaden our defence network in Australia and further consolidate relationships. Our mission to lift international barriers and help global partners reach industry and government stakeholders has borne fruit. Thanks to the Victorian Government for inviting us to be a part of their Victorian Government Pavilion at the Airshow. It was a great honour and demonstrates our close ties with government stakeholders. 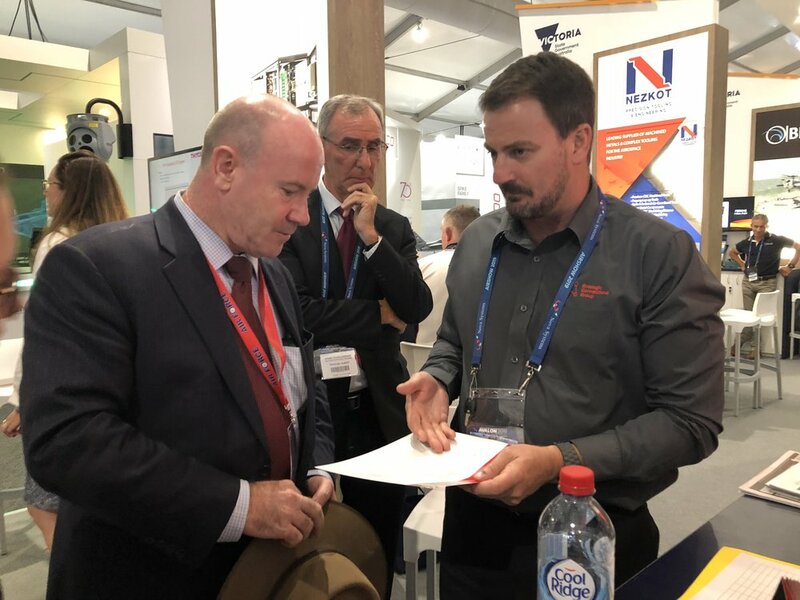 Some highlights from the Airshow for SCG include signing a Memorandum of Understanding with Valuechain and Anywise, meeting with the Victorian Defence Advocate John O’Callaghan and the Hon. Martin Pakula, Minister for Jobs, Innovation and Trade, Tourism, Sport and Major Events and, Racing. Strategic Connections Group would also like to thank our staff members who represented the company during the Airshow, particularly Darren Cooper, our Defence Business Manager, and Julian Allen, our Innovation Manager. For complex markets, it’s the people that will bring you to the right pathway, and these people certainly drove our successful Airshow campaign. We would like to thank all those who came and showed interest in our company over the past week. If you are interested in how we can support you within the Defence sector, we encourage you to contact Darren Cooper at darren@strategicconnectionsgroup.com. It is with great pleasure that SCG introduces Guillaume Briand as our new Engineering Manager. As SCG has seen significant growth over the last 24 months, it has become important for the introduction of a Management Team to support our growing staff and clientele. Guillaume Briand joined SCG in June 2018 as a Project Engineer, where, for the last 7 months he has assisted Downer Group on delivery of the HCMT Project. With an Master’s Degree from Grenoble specialising in Mechanical Engineering and Hydraulic Systems as well as extensive experience in project management, Guillaume will provide leadership and direction to our team of engineers working in both technical and project-based roles, building our engineering support systems for our rail and defence clients. Prior to joining SCG, Guillaume worked as a Design Mechanical Engineer at Refuel International, a specialist designer and manufacturer of aviation refuelling equipment. Some of his achievements at Refuel include the design of a 16kL, 8x4 refuelling truck for the RAAF JP157 program and of the first Hybrid Refueller/Hydrant dispenser for the asian market. Guillaume has also worked for major companies in Australia and overseas, including KSB Australia where he was involved with the project management of high level packaged pump skids for the oil and gas, water and mining industries. In France, he worked 5 years for AREVA NP as the auxiliary pump-units technical lead for the EPR Flamanville 3 nuclear power plant. Outside of his engineering career, Guillaume enjoys playing the guitar as well as running, cycling and kitesurfing. He is fluent in French and English. We welcome Guillaume to this role and wish him all the best. What if you could streamline your supply chain to leverage better compliance outcomes? Today at Avalon 2019, Strategic Connections Group signed a Memorandum of Understanding (MoU) with ValueChain and Anywise to create a data system that helps businesses better understand and analyse their supply chains. This MoU has been in the works since SCG attended Euronaval in Paris of October 2018. During Euronaval, Charlotte Morris of the Victorian Defence Alliances (VDA) introduced our representatives to the people at ValueChain and Anywise. From that point, the Victorian State Government and key stakeholders have supported the three companies to collaborate and innovate. Thanks to this support, we have been able to engage in thorough and ongoing discussion to expound upon and elucidate our ideas into the collaborative arrangement, formalised today. ValueChain is a UK based company specialising in technology design. They have created a collaboration network, iQluster, which facilitates innovation by increasing access to knowledge and experience of work already completed by participating businesses. iQluster is relevant for the transport industry of Victoria as it can immediately leverage the foresight gained from SCG’s extensive list of previous transport projects. Anywise is a Victorian based company who specialise in distribution and transformation of data. They can enhance profitability of supply chains by decreasing the number of suppliers, improving information accuracy and reducing risk. Adding to the mix SCG’s industry expertise, stakeholder management and data collection proficiency, the strategic partnership looks set to pioneer the future of supply chain management. The Victorian State Government has been instrumental throughout this entire process. Particular thanks needs to be given to Georges Di Scala from Ecodev, Tony Heath from Defence Investment and Trade – Europe & UK and Claire Willette from the Australian Defence Alliance – Victoria. These three individuals have reinforced to us the effort and lengths that the Victorian State Government is willing to go to, to deliver for its resident companies. Moreover, linking two Victorian companies to ValueChain’s iQluster network promises to open up more collaboration opportunities with European and British companies, not only for SCG and Anywise, but for all of our partnering and affiliated companies. This will provide considerable assistance in marketing resident capabilities to international markets, driving industry growth. Our supply chain data system will further enhance understanding of resident capabilities by assisting international clients to better understand and optimise the support they can receive from companies in Victoria. SCG’s team is made up of a unique diversification of competencies, from engineers and industrial designers, freight and logistic experts through to innovation and business systems specialists. Having such a diverse team allows us to support highly complex, large scale and sensitive projects. A major aspect of what we do is connect companies with key stakeholders to help them streamline their projects. Being part of the Victorian Government Pavilion at Avalon 2018 places us at arm’s reach from key industry stakeholders and players. Speak to us today about getting yourself on the right pathway to success in the defence and rail sectors. For complex markets, it’s the people that will bring you to the right pathway. Come and meet those people this week in the Victorian Government Pavilion to discuss how SCG can support you within the Defence sector. Representing SCG during the Australian International Airshow Aerospace & Defence Expo will be Darren Cooper, our Defence Development Manager and Julian Allen, our Innovation Manager. We’re all set up and ready to bring you into the fold of our extensive network of international business and key defence industry players. Let us lift international barriers for you to reach industry and government stakeholders here in Australia. Preparations are complete for SCG’s campaign at the 2019 Airshow at Avalon. Thank you to all of our valued clients and partners for such a lovely evening at the annual SCG End of Year Celebration. Strategic Connections Group has just completed a busy half year delivery projects with our partners. Currently, 21% of the Australasian rail workforce are women. This puts SCG slightly ahead of the curve. However, within SCG and across all companies who operate in the rail industry, there is still a significant amount of ground to cover before we reach 50/50.